Is your current job making you fat? How can you reverse the situation without having to leave the position? A new CareerBuilder survey finds that 57 percent of the nation’s workforce believe they are overweight, and 45 percent believe they’ve gained weight at their present job, on par with last year. Twenty-six percent of all workers said they gained more than 10 pounds at their current job; 1 in 10 (11 percent) gained more than 20 pounds. The nationwide survey was conducted by The Harris Poll on behalf of CareerBuilder from April 4 to May 1,2018 among a representative sample of 1,117 full-time workers across industries and company sizes in the U.S, including 1,012 in the private sector. 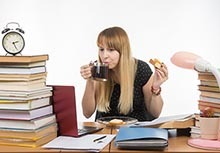 Despite more than a third of workers who have gained weight at their present jobs saying they’re too tired or don’t have time to exercise, the majority of U.S. workers (58 percent) say they exercise on a regular basis. While 63 percent of workers in the West say they exercise on a regular basis, 59 percent of those in the South, 56 percent in the Northeast and 53 percent in the Midwest say the same. But what does “on a regular basis” mean to Americans, and how much exercise is actually helping them lose weight? Nearly three in 10 (29 percent) regularly work out three or fewer days a week, and 29 percent regularly work out four or more days a week. Consistency is key – 26 percent of U.S. workers who regularly work out four or more days a week say they lost weight at their present job, compared to 12 percent of those who regularly work out three or fewer days a week. Forty-two percent of workers don’t work out regularly or at all, and 48 percent of this group say they gained weight at their current job. Exercise isn’t the only key to losing weight — as they say, you are what you eat. Nearly a quarter (23 percent) of U.S. workers eat out at least three times per week for lunch instead of packing their lunch. Eleven percent of workers find their grub from the vending machine at least once a week. Workers are then taking their meals back to their desks — 63 percent eat from their workstation. But lunch isn’t the only time the U.S. workforce is eating. Workers are munching away most of the day — 72 percent of workers snack on the job. Some employers are stepping in to help their employees get fit, but are employees using these tools? Three in 10 (30 percent) workers say their company provides gym passes, workout facilities or wellness benefits, but 19 percent of this group don’t take advantage of them. Sixty-one percent of workers say their employers do not offer wellness benefits, but if offered, 37 percent believe they would take advantage of them.